Recycle Everything in your Life! Start Recycling Everything If You Can't Reuse It! 3. 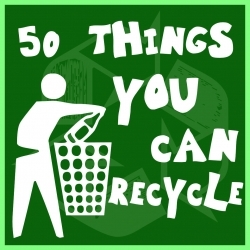 There are many places you can exchange or recylce your old electronics. 15. Can't figure out what to do with your old lamps, wall decor, or knick knacks? If you can't eBay them, donate them to a thrift store for charity purposes. Craigslist and Kijiji are good alternatives, too. 44. Old books can be sold on Amazon, or donated to thrift stores. There's always the yard sale option, too.